Debates on the relationship between religion and human rights at international, regional and national level often display a remarkable degree of misunderstanding and obfuscation. This lack of clarity has, on many occasions, led to the claim that certain tenets of major global religions are inherently incompatible with universal human rights. While in some parts of the world, religion is primarily conceived as a matter of conscience and individual choice. In other regions, religion is understood as something to which individuals belong to, something akin to family, ethnicity or nationality. Due to the process of globalization and migration, these different concepts co-exist today within the same geographical area and have an impact on the way freedom of religion is conceived, creating social tensions that need to be managed and addressed. In such an evolving environment, more cross-cultural and inter-religious dialogue is needed to combat misunderstanding and mistrust and strengthen human rights protection, particularly of vulnerable groups such as women and children. 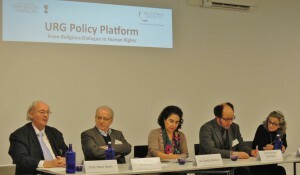 The Universal Rights Group invited representatives from the world’s major religions, academics specializing in religious dialogue and human rights, senior officials from the Office of the High Commissioner for Human Rights, and relevant United Nations Special Rapporteurs to participate in a Policy Platform which took place on 18 February 2015 at the Global Ethic Institute, University of Tübingen, in collaboration with the Center for Islamic Theology, Eugen Biser Foundation, Hanns Seidel Foundation, Baden-Württemberg Foundation and the Weltethos Foundation. 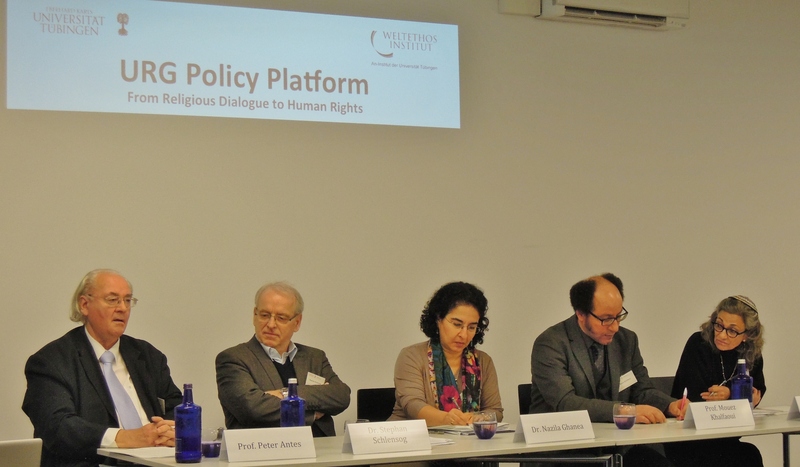 The central question for this Policy Platform was whether there is incompatibility between religion and human rights. The goal was to dispel the myth of incompatibility between religion and human rights by bringing together religious and community leaders, human rights defenders, academics and government representatives in a forum for constructive inter-religious dialogue. It, thus, sought to address the historical and theological basis for assertions that certain religious tenants are incompatible with universal norms, deconstruct these assertions through robust argument and analysis, and bring into debate the role of religion in the legal and political international human rights framework, especially as it relates to the promotion and protection of women and children’s rights.